The five key characteristics of great business teams. How leaders of high-performing teams behave. 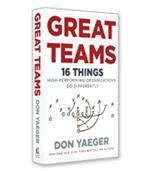 How members of high-performing teams behave. What teams and leaders need to do to align themselves around a goal. How great teams make decisions and overcome challenges.